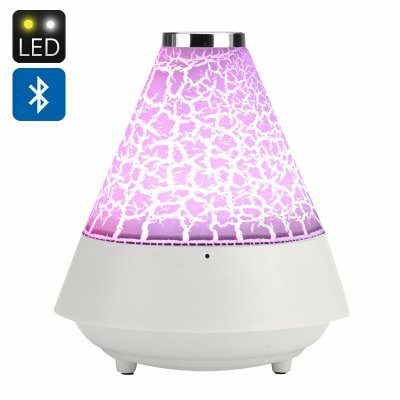 Successfully Added T12 Bluetooth Speaker with Color LED – Bluetooth 2.1 +EDR, Handsfree, Micro SD Card Support, FM Radio (White) to your Shopping Cart. Blast your favourite tunes and enjoy a custom light show as you do it. The T12 Bluetooth Speaker comes with color LED lights, micro SD card support and FM radio. The T12 Bluetooth speaker is a nice little audio gadget for your home or office. It comes with a creative design and convenient little stands to make sure it’s always stabilized. Coming with Bluetooth 2.1 + EDR (Enhanced Data Rate), the small speaker will smoothly stream all your favourite tracks or audio files in great quality. Thanks to the built-on 700mAh battery, you will have up to 5 hours of continuous music play time between re-charges. You will also have the option of taking your calls handsfree. The T12 comes with nice color LEDs and several light modes, letting you set a custom light for any mood or occasion. From bright red to fresh green and soft pink, you can change the look and feel of your room with just one press of a button. The speaker comes with an easy set of controls on the top, letting you conveniently control playback and switch between light modes. With the support of a micro SD card (up to 32GB), you can keep your favourite files right on the speaker.